Visit the CCC to see what’s offered to students and alumni as they seek their calling in today’s workplace. 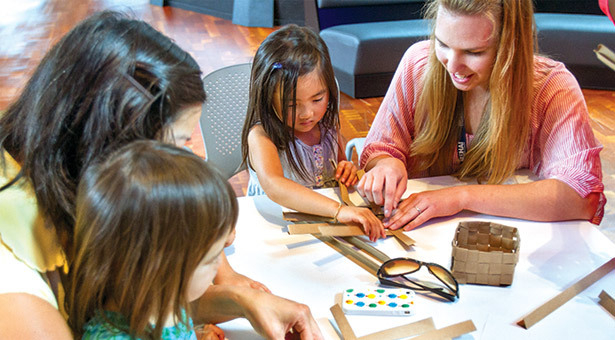 Seattle Pacific senior Lydia Hazel, far right, teaches a preschooler how to weave a paper basket as part of the Family Lab at the Museum of History and Industry. On a Saturday just before noon, 4-year-old Avery sat quietly at a table with her parents and younger brother. She cut an “A” out of foil and placed it in a clear tub of shallow water, as guided by Seattle Pacific University senior Lydia Hazel. Next, she dabbed a soapy toothpick behind the foil, sending the “A” shooting across the tub. The experiment was part of the Family Lab, a weekly program at Seattle’s Museum of History and Industry. It is designed to connect kids of all ages to one of the museum’s exhibits: in this case, the Slo Mo Shun IV, a wooden hydroplane that broke speed records in 1950. Other activities have included weaving paper baskets (a link to the Native American exhibit), folding paper airplanes (Seattle’s airplane industry), and building harmonicas (the jazz age). 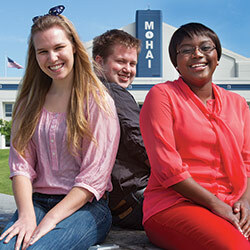 Left to right: Student interns Lydia Hazel, Forest Brown, and Liz Kimotho enjoy MOHAI’s new location in Seattle’s South Lake Union neighborhood. After working with past SPU interns, McCauley asked Michael Hamilton, associate professor of history, if SPU would like to partner with MOHAI to help create the Family Lab. Hamilton was enthusiastic, and now recruits nine students a year for the internship. Interns study the city’s past, create lesson plans, and learn how to teach activities to children and families. The Family Lab started in January 2013, about the same time MOHAI moved across the city to South Lake Union. Hazel says it’s been fun to have so much access to the museum, which showcases the history of Seattle and the Puget Sound region through artifacts such as Boeing’s first commercial airplane, Starbucks’ first sign, and the Sonics’ 1979 NBA Championship trophy. While a preschooler such as Avery may not be able to grasp that idea quite yet, she did leave wanting to come back. And she made sure to take her foil “A” with her.